On Monday August 4th a fire destroyed Abundant Life Seed Foundation’s offices. Our catalog seed inventory, World Seed Fund seed inventory, computers and other administrative systems were lost. We have some offsite backup of seed archives and electronic data. Seeds were also salvaged from the fire – some stored in file cabinets inside tins – and we will be examining their viability. Nearly 200 varieties are in production with our Seed Growers Network. These varieties will form the core of the 2004 catalog. Over the coming weeks we will assess the total damages to our operations and keep you updated on this web site. Click Here for a snapshot of the August 14th web site. On August 4, 2003 our seed catalog operations were destroyed by a fire. We are not currently selling seeds or distributing catalogs, nor will we offer seed sales in 2004. World Seed Fund and other programs will continue. Please read the FIRE UPDATE for more info. Also, please consider making a DONATION to rebuilding our nonprofit programs. A high priority is to rebuild the infrastructure of the WORLD SEED FUND, whose mission is to charitably distribute quality open-pollinated seeds and seed saving knowledge to those who need them most. WSF recipients have few, if any, sources for meeting their seed needs. Abundant Life seed produced in 2003 will be purchased from our Seed Growers Network and distributed through the WSF, with distribution beginning as early as January of 2004. One half of the fire donations will go towards the reconstruction and betterment of this program. Click Here for a snapshot of the November 20th web site. 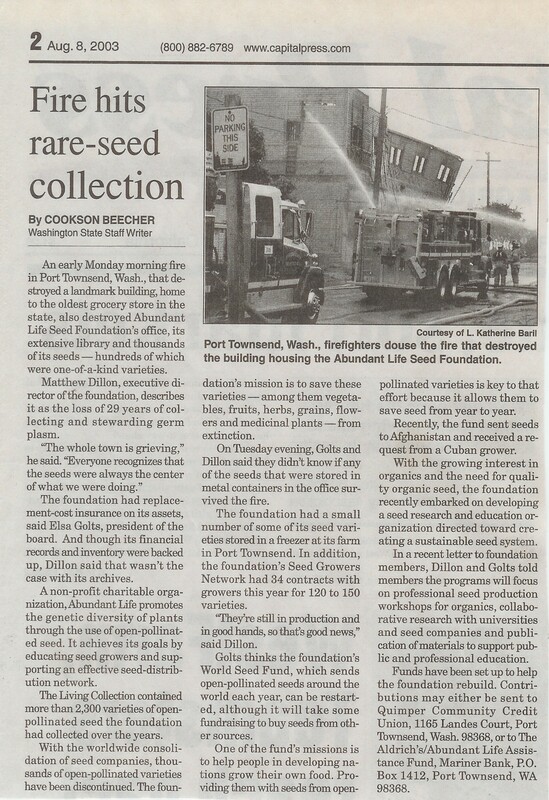 Abundant Life Seed Foundation's fire not only destroyed their offices and seed packaging facilities, but also most of their seed inventory and much of their gene bank. The timing of the loss prevented the ability to print the 2004 seed catalog. With the season lost, the board of directors had time to reflect on past accomplishments and future goals. They concluded that the foundation's top priority should be the future work of the Organic Seed Alliance and the World Seed Fund. They decided to relinquish the seed catalog business, and "let others carry on the work of offering seeds to their loyal customer base." The Territorial Seed Company purchase the seed sales operations of the ALSF as a for-profit "sister company" beginning in the 2005 season. No longer a non-profit organization, they are doing business as Abundant Life Seeds.